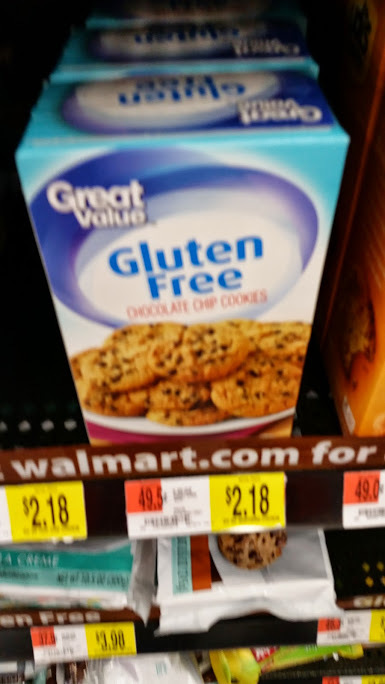 So we mentioned Wal*Mart’s extensive new line of gluten free products. Some of you noticed those as well. Another thing we found were gluten free chocolate chip cookies. Who can go wrong with cookies, especially at a reasonable price. This sort of reminds me of the Chips-Ahoy style container, not the small little containers that usually come with gf cookies. Definitely excited to see this, and the other cookie varieties, as it will hopefully improve pricing on the ‘traditional’ gluten free products. We definitely do not want to see them go out of business, but we want cheaper prices so we don’t go out of business! As we see more national brands of gf products, I think we will see prices lower.